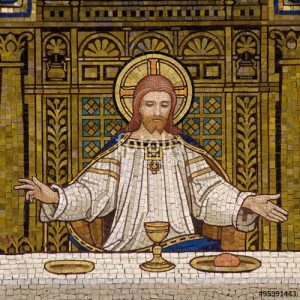 “The bread used in the celebration of the Most Holy Eucharistic Sacrifice must be unleavened, purely of wheat, and recently made so that there is no danger of decomposition. It follows, therefore, that bread made from another substance, even if it is grain, or if it is mixed with another substance different from wheat to such an extent that it would not commonly be considered wheat bread, does not constitute valid matter for confecting the Sacrifice and the Eucharistic Sacrament. It is a grave abuse to introduce other substances, such as fruit or sugar or honey, into the bread for confecting the Eucharist. Hosts should obviously be made by those who are not only distinguished by their integrity, but also skilled in making them and furnished with suitable tools” (Redemptionis Sacramentum, 48). “The wine that is used in the most sacred celebration of the Eucharistic Sacrifice must be natural, from the fruit of the grape, pure and incorrupt, not mixed with other substances…. Great care should be taken so that the wine intended for the celebration of the Eucharist is well conserved and has not soured. It is altogether forbidden to use wine of doubtful authenticity or provenance, for the Church requires certainty regarding the conditions necessary for the validity of the sacraments. Nor are other drinks of any kind to be admitted for any reason, as they do not constitute valid matter” (Redemptionis Sacramentum, 50). “The Ordinary is competent to give permission for an individual priest or layperson to use low-gluten hosts or mustum for the celebration of the Eucharist. Permission can be granted habitually, for as long as the situation continues which occasioned the granting of permission” (24 July 2003, Prot. N. 89/78 – 17498). Pastors are to be advised that several companies producing hosts do so in both gluten-free and low-gluten forms, and that gluten-free hosts are not valid matter for the Eucharist. A list of suppliers of low-gluten hosts which are valid for use in the celebration of Mass may be downloaded from the USCCB’s website or acquired by contacting the Office of Liturgy. With regard to wine to be used for the celebration of Mass, pastors should equally be aware that much of the wine that is sold in retail stores is either of doubtful liceity or validity. This is due to the fact that many products sold as “table wine” often contain added water (up to 25%), cane sugar, beet sugar, corn syrup, high fructose corn syrup, other fruit concentrates, and stabilizing chemicals. In these cases, such wines do not satisfy the requirements that sacramental wine be “fruit of the grape, pure and incorrupt, [and] not mixed with other substances.” With this in mind, only wine that is labeled for sacramental use and which has received ecclesiastical approbation should be used for the celebration of the Eucharist. A list of companies that produce wine that is approved for sacramental use may be obtained from the Liturgy Office.